FORT HOOD, Texas–A new pregnancy healthcare method proven to reduce the risk of preterm birth and lead to healthier outcomes for both mom and baby is launching next month at Carl R. Darnall Army Medical Center (CRDAMC). Centering Pregnancy, a 10-session prenatal care model conducted in a small group setting, will hold its first session February 19 for expectant mothers due August 1-15. The group sessions provide expectant moms 10 times more visits with their provider than traditional prenatal care, plus the added benefits of conversations, education, support and group bonding. The prenatal care program includes individual health check-ups and resources to help an expectant mother better prepare for birth and care for the baby. Participants also will receive information and tools to help make healthier choices. 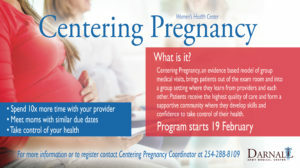 “Centering offers women a chance to share their concerns and successes with other moms, and provides a fun way of leaning and interaction that is not possible during clinic encounters,” said Molly Hunter, CRDAMC’s centering coordinator. Sessions are held once a month in the beginning of the pregnancy period and then twice a month toward the due date. Each two-hour session provides the expectant mother with time for a one-one-one with their provider. Hunter said Fort Hood has on average 180 women a month finding out they are pregnant. “Being a mother in the military environment increases the stress level other women don’t have. Participation reduces that stress and builds friendships and support,” said Hunter, adding that women report a 96 percent satisfaction rating with the centering program. But the program doesn’t end when the babies are born. Hunter said the group will have a graduation party where the new mothers can introduce their newborns to the group. The program is available on a first come, first served basis with class size limited to around 15 Participants. Interested mothers-to-be can pick up an application at CRDAMC’s Women’s Health Center. The next group will be March 14 for mothers due August 16-31. For more information contact the Centering Pregnancy Coordinator at 254-288-8109.